It’s been a scorcher today, the hottest day of the year in fact, and what I really wanted to be doing was lying out in a lusciously green park with a good book and a bottle of chilled wine, lazily watching the world go by. What I didn’t want to be doing was rushing from meeting to meeting, grabbing a sandwich to hurriedly eat at my desk, responding to emails all day and travelling home on a hot, airless train, sticky and uncomfortable. Guess which one was my reality – along with the thousands of other London office workers who wished they could be somewhere else today. But this evening I can be transported to that green park by the delicious and very English summer pudding that I’ve made up which awaits me after I’ve eaten dinner: Eton mess. Traditionally served at Eton College on 4th June, this sticky, gooey pudding is a delightful mixture of strawberries, broken meringues and whipped cream. It is a mess, hence the name, but it tastes great. Tonight I’ve added, very untraditionally, white chocolate pieces for an extra treat, and I’m entering it into June’s ‘In the Bag’ event. 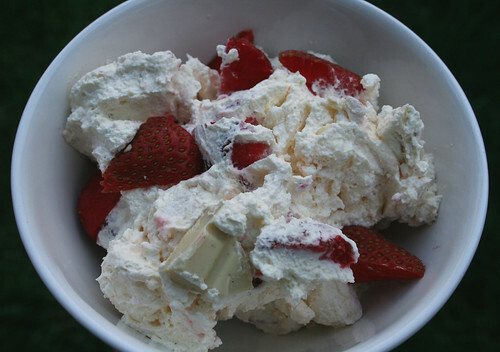 The bag contained strawberries and white chocolate and if this pudding has got your juices flowing you’ll be pleased to hear that the deadline for entries has been extended to Sunday 6th July.